From $70 per meter square supply only. 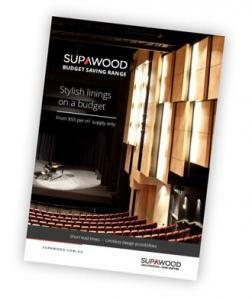 If you’re looking for great style and value, SUPAWOOD Budget Saving Range has a variety of lining solutions to suit. The range features cost-saving options on our most popular wall and ceiling systems and is ideal for retail, restaurant, home and office applications. From slats, blades and beams to panels and drop-in tiles, now you can get the quality SUPAWOOD linings you’ve come to trust at a great low price! All products between $70 and $175 per m2 (ex GST and freight). Easy to specify and install. Design Flexible Modular Slat System - Versatile linear slatted timber panels. | Slats with black cross battens only | 190mm wide | 50mm gap | SUPAFINISH veneer and coloured laminates. The Rustic Timber Lining - Etched natural solid timber which creates a unique, weathered effect. | 90mm wide loose slats | 190mm | 40mm gap | Nail fixing recommended | Choice of 5 colours. Rectangular Features - Create unique blade ceilings, walls and screens. | 290mm deep rectangular blades @ 400 centres | Includes matching edges | SUPAFINISH veneer and coloured laminates. Lightweight Beam System - The elegance of heavy duty timber beams without the hassle of working with solid timber. Adaptable Acoustic Panels - Decorative acoustic panelling offering superior noise control. | Includes integrated acoustic textile | Raw MDF edges | SUPAFINISH veneer and coloured laminates. Floating Panel System - Floating modular noise control kits. | SUPAFINISH veneer and coloured laminates. are decorative and quick to install. | Includes matching edges | SUPAFINISH veneer and coloured laminates. Decorative Panel System - Premium feature decorative panels for walls and ceilings. | Raw MDF edges | SUPAFINISH veneer and coloured laminates. Available with decal fixing or concealed fixing and edges for walls. Price varies per fixing option. Solid Drop-in Tiles - Accessible drop-in ceiling tiles that are decorative and quick to install. Seamless Wall + Ceiling Panels - Eye-catching textured looks. | Available in 4 standard textured finishes - Warm Slats, Off-form Concrete, Rustic Timber and Rugged Concrete.